HTMonkey is a UserScript for Greasemonkey (an extension for Firefox/Mozilla). Originally developed for the old (v6 IIRC) hattrick interface, has been adapted (and almost entirely rewritten) to the new interface. It is a beta (thus meaning it is not complete/has some bugs). Adds a box on any of the blank frames with shortcuts to your preferred teams and their respective links. With HTMonkey: Just click in the link on the friends box. Without HTMonkey: Go to search, enter name, press enter and then click in the team! Adds a box below the friends' box with a form to quickly view the information of a player, team or match, providing the ID. This helper application article is a stub. 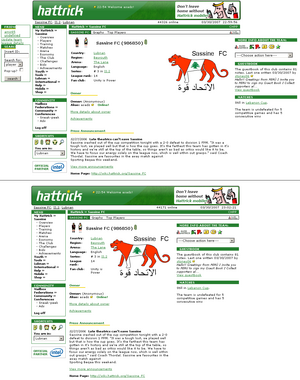 You can help Hattrick Wiki by expanding it. This page was last edited on 26 July 2009, at 21:37.